David Low was a flax and jute spinner throughout his working life. 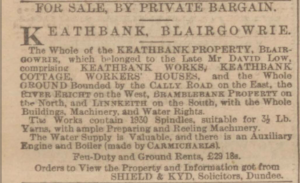 After working for his father's firm, he entered into business with his brother, Allan (D & A Low) at Keathbank in Rattray. He acquired a further mill in Dundee. 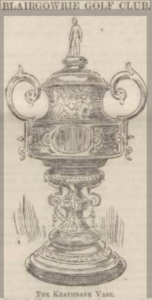 Member of Blairgowrie Golf Club, to which, in 1892, he presented a "handsome and valuable silver cup, for annual competition." This was known as the Keathbank Vase. Subscriber 70 – Allan Edward – an early employer of David Low. David’s younger brother was given the name of Allan Edward, perhaps indicating a parental friendship or esteem in which he was held. Note – Allan Edward’s wife was named Marjory (May) LOW. 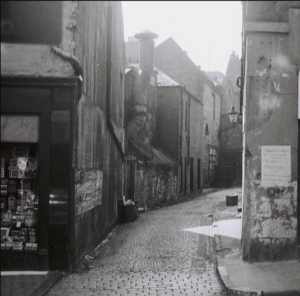 Subscriber 164 – William Nairn – father of John Nairn, manager and subsequent owner of Ann Street Works on the death of David Low. David Low was the son of a flax spinner, Matthew Low and "received a thorough training, both practically and commercially, in the business." It was reported that he, in his early working years, was employed by 'Allan Edward, flax merchant.' He was then listed, in 1861, as having been employed within 'Low & Fife,' a business at Keathbank in Rattray of which his father was co-partner. At that point, David Low would have been in his mid 20s. Shortly after, he himself acquired Keathbank Mill, Rattray, after the dissolution of his father's firm, 'Low & Fife' in 1865. He entered into business there along with his younger brother, Allan Edward Low, under the title of 'D & A Low,' flax spinners, whereupon he embarked on major improvements to the mill. His brother Allan had been employed as a clerk under his father's management. David Low subsequently acquired Ann Street Works, Dundee, around 1868. It was reported that he had been very successful in business. David Low was born in 1837, the oldest son of Matthew Low, a flax dresser and Margaret Duncan, his second wife. His father, Matthew, became a well known flax dresser, flax spinner and merchant, firstly in the Wellgate area of Dundee and latterly, at Keathbank Mill in Rattray. His father’s operations in Dundee were concentrated in Dallfield Walk, Coupar’s Alley and Kirk Entry. The Valuation Rolls of 1855 indicated that Matthew Low tenanted a warehouse and attic at 16 Dallfield Walk and that he owned 4 weaving shops in Dallfield Terrace (aka Dudhope Street). By 1858, his son David having reached the age of maturity, Matthew Low and the rest of his family removed to Keathbank in Rattray, leaving David to oversee operations in Dundee. David Low’s first listing in the local Directory appeared in 1861, being of ‘Low & Fife,’ and living in Kirk Entry, a lane almost opposite that of Coupar’s Alley (where Low & Fyfe operated their flaxspinning firm), running east towards the steps of St Andrew’s Church on the Cowgate. In 1865, when his son David was working for him, listings indicated that Matthew Low tenanted a ‘counting house in Coupar’s Alley.’ Coupar’s Alley and Kirk Entry ran west and east (respectively) off the Wellgate, while the Dallfield area ran west from the bottom of the Hilltown. 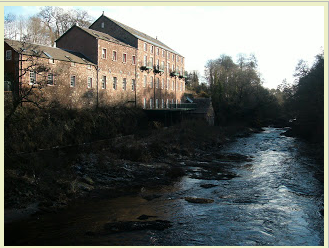 Keathbank Mill in Rattray was originally erected in 1830, directly across the River Ericht from Oakbank Mill. It was here that Matthew Low went into partnership with William Fife, who in 1851, was listed as a mechanic at Keathbank. In 1864, Matthew Low at Keathbank possessed a fairly modest concern with his waterpowered mill, producing 12 hp with 660 spindles, employing 40 hands. By 1865 however, his partnership with William Fife was dissolved (Matthew by this time a man in his 70s). Thereafter, it would appear that David Low, together with his younger brother Allan assumed the responsibility for the running of the mill on the Ericht and, through them, an expansion plan was formed. 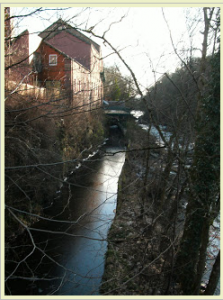 The original mill was demolished and ‘a new and larger mill was erected a few yards further downstream, in order to increase the fall by the then owners, Messrs Low. 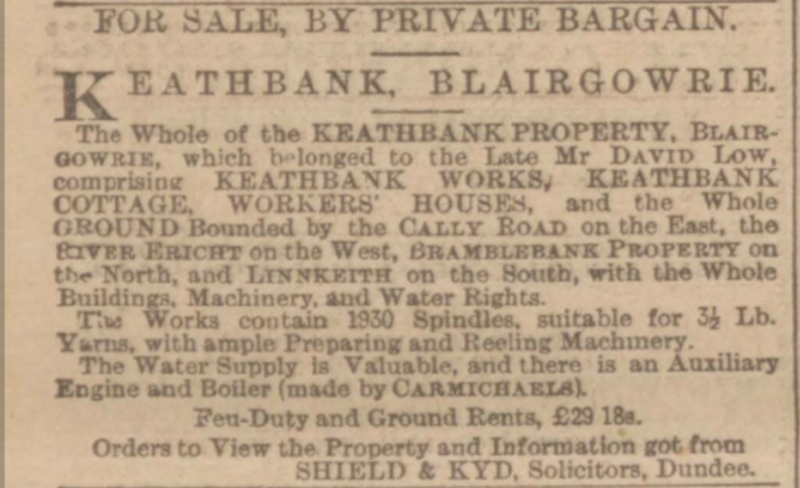 In November of the same year, it was reported that further improvements were to be made at Keathbank in the fact that ‘We observe preparations going on for an addition to Messrs D & A Lows’ Works at Keathbank. A large warehouse is to be built at the south end of the new factory and a steam engine is to be put up at the other end in a short time.’ This new mill was driven by a waterwheel and power steam engine by Carmichael of Dundee. By 1880, it employed 100 people and yarns were produced for the Forfar trade. Ann Street Mill was acquired by David Low around 1868. Its extent was described thus – Ann Street Works. This name is applied to works extending from Ann Street to Alexander Street and bounded on the east by William Street and on the west by Ellen Street. The buildings are one storey. Lately erected. Average hands employed 145 and 2 engines of 30 hp each. The manufacture is jute spinning. David Low is the proprietor. David Low operated a business from Ann Street Mill for thirty years, contemporaneously with Keathbank Mill. The fate of Ann Street Mill after David Low’s death lay in safe hands. John Mathieson Nairn (son of William Nairn, merchant in Dundee), an engineer and already a manager of ‘Messrs David Low & Co’ (as it had then become known) became sole proprietor of the company. David Low had been very highly regarded by his employees and was presented a year before his death with ‘an illuminated address, in recognition of his many generous acts and as an expression of the kindly feelings that had always existed between him and his workers.’ The workers of both mills sent floral tributes to his funeral. On his death, he left a total estate of £38,041 16s 5d to his brothers, sister and nieces, with a small legacy to his housekeeper. He left no public bequests. Old Parish Registers. Dundee. (1837). 282/180 142. Scotlandspeople website. Statutory Registers. Dundee. Deaths. (1898). 282/1 124. Scotlandspeople website. Dundee Courier. 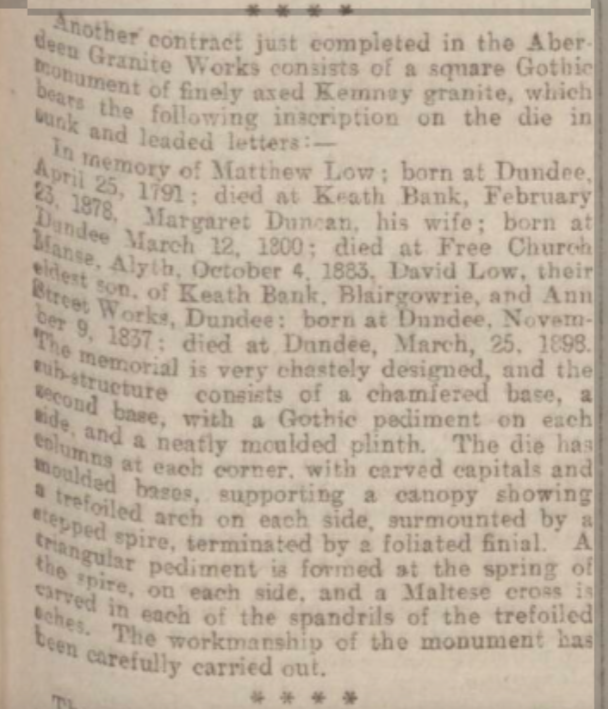 26 March 1898. p.5. Findmypast website. Dundee Postal Directory, 1864-65. p.146. Dundee Central Library, Local Studies. Dundee Postal Directory, 1867-68. p.153. Dundee Central Library, Local Studies. Dundee Postal Directory, 1884-85. p.221. Dundee Central Library, Local Studies. Dundee Advertiser. 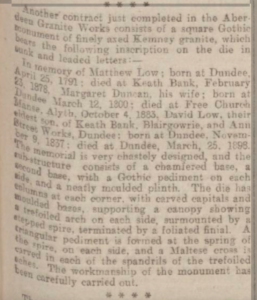 31 March 1898. p.5. Findmypast website. Blairgowrie Advertiser. 2 April 1898. British Library Board. British Newspaper Archive website. Blairgowrie Golf Club. (1990). A History of Blairgowrie Golf Club 1889-1999. Dundee Postal Directory, 1861-62. p.167. Dundee Central Library, Local Studies. Dundee Postal Directory, 1871-72. p.143. Dundee Central Library, Local Studies. Dundee Postal Directory, 1869-70. p.161. Dundee Central Library, Local Studies. Dundee Postal Directory, 1874-75. p.180. Dundee Central Library, Local Studies. Dundee Postal Directory, 1878-79. p.192. Dundee Central Library, Local Studies. Millar, Alexander Hastie. Glimpses of Old and New Dundee. (1925). Dundee. Malcolm C MacLeod. p.69. Perry's Bankrupt Gazette. 9 December 1865. Findmypast website. Dundee Advertiser. 7 November 1865. p.7. Findmypast website. Census Records. Rattray. (1861). 389/ 2/ 17. Scotlandspeople website. Valuation Rolls. Dundee Burgh. (1855). VR009800001-/121. Scotlandspeople website. Valuation Rolls. Dundee Burgh. (1855). VR009800001-/122. Scotlandspeople website. Dundee Postal Directory, 1858-59. p.152. Dundee Central Library, Local Studies. Valuation Rolls. Dundee Burgh. (1865). VR009800016-/200. Scotlandspeople website. Census Records. Rattray. (1851). 380/ 3 21. Scotlandspeople website. Warden, Alexander J. The Linen Trade Ancient and Modern. (1864). London. Longman. p.654. Dawson, Peter S. The Old Mills on the Ericht in Blairgowrie and Rattray. (1950). Blairgowrie Public Library. Dundee Advertiser. 25 May 1898. p.2. Findmypast website. Ordnance Survey Name Books. Forfarshire, Angus. (1857-1861). Volume 29. ScotlandsPlaces website. Biographical History. John Mathieson Nairn. GB 254 MS. University of Dundee Archives Services. Dundee Courier. 16 May 1898. p.2. Findmypast website. Legal Records. Wills and Testaments. Dundee Sheriff Court. (1898). SC45/31/50. Scotlandspeople website. Dundee Courier. 21 May 1898. British Library Board. British Newspaper Archive. Hugh for useful source materials. The information above about David Hallyburton Low has been collated from a range of digital and hard copy sources. To the best of our knowledge it is correct but if you are relying on any information from our website for the purpose of your own research we would advise you to follow up the sources to your own satisfaction. If you are aware of an inaccuracy in our text please do not hesitate to notify us through our Contact page.